A horse of her own would be awesome. But Kate figures that might be a long way away, especially since she had to give up riding lessons and move to her late grandfather’s farm. Besides, it would be a lot more fun to have a best friend to ride with. 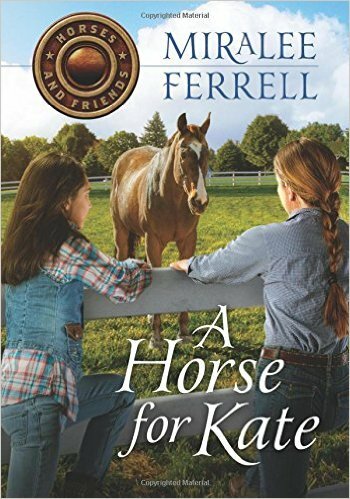 When Kate discovers a barn on their new farm that’s perfect for a horse, and a dusty bridle too, she starts to think that her dream might come true. Then she meets Tori at school, who is totally the best. So when they discover a thoroughbred that appears to be all alone, could it be the answer to her prayers? Maybe. If she can convince her dad ... and figure out what’s going on with that horse. I really enjoyed "A Horse for Kate" (and the whole series). This was my first time reading anything by Miralee Ferrell. My twelve year old daughter didn't want to read these books, so I read them to my 6 & 4 yr olds. We enjoyed talking about the book afterwards. This book addresses friendship, kindness, and respect for adults. It also brings out character issues such as telling the truth, putting others first, and treating everyone kindly. I loved being able to discuss these things in the the book with my daughters.